Hughes applied for accreditation through the Step Ahead Recognition System (STARS) — a quality recognition system for child care, preschool, and after-school programs in Vermont. STARS programs must demonstrate proficiency above and beyond state regulations to provide professional services that meet the needs of children and families. The STARS program aims to give educational centers an opportunity to look objectively at the programs they provide by using quality indicators to identify strengths and areas for improvement. Earning a minimum of three STARS is required for preschools to qualify for the state’s universal prekindergarten, which will begin to take effect July 1, 2015. Parents that choose a provider that is accredited or has 3, 4, or 5 STARS and meets the income guidelines may qualify for a low income child and dependent care tax credit, according to the state Department of Children and Families website. During the 2014 Legislative session, Legislators passed and Governor Shumlin signed Act 166 which provides universal publicly funded prekindergarten education for a minimum of ten hours per week for 35 weeks annually for all 3-, 4- and 5-year-old children who are not enrolled in kindergarten. However, not long after the law was passed, the state granted a delay for the implementation of universal prekindergarten (from July 2015 to July 2016) to allow sufficient time for the adoption of administrative rules to guide implementation and to provide school districts, school board members, and voters adequate time to adapt their budgets to support universal prekindergarten education. It is now up to school districts to decide whether to implement universal prekindergarten education starting in 2015 or 2016. Hughes is not sure if the Killington preschool will be among those that are publicly funded within the school district, but says it’s important to achieve the top accreditation so that parents and school officials know the quality of instruction their children are receiving. 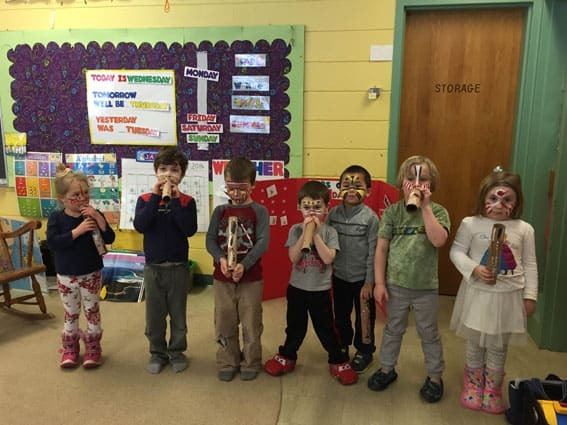 This is Hughes’ first year directing the preschool at Killington (P@K), which is currently a private pre-kindergarten program located in the elementary school. She runs P@K along with Megan Bates, the assistant teacher. Hughes has worked in various fields within education for 35 years, but this is her first year working with preschool age children. “We have just finished studying the first of 12 countries, which was Australia, and we will be traveling all over the world. I call the unit “Passports,” as I want the children to understand what the word “global” actually means when we talk about our world. Through the study of different cultures the children are developing a focus on the differences in various parts of the world,” Hughes said. Hughes emphasizes that children learn best through play, which enhances the learnin gof skills, knowledge, and dispositions that guarantees success in later schooling. “I have ten students who can’t wait to come to school,” Hughes said with a smile. While she is glad the program has started small, Hughes hopes to grow the number of students enrolled in the years to come.